So How Does the Casimir Mechanism really factor in?? Yes that's right I AM BACK in the Research Facility. We released Samantha out of the Kassimir Mechanism which is the same thing Gersch was in. When we think of the Mystery Man Easter Egg and the Cryogenic Slumber Party Easter Egg, what is different and what is the same. In both power and charging up is required. 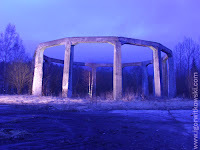 We need to give the orb power for Gersch as it rises up in the sky to where?? Yes the moon Gersch escapes making sam very mad. Why did Sam want Gersch in the first place? Just a recap in case you are unaware..Sam took over Yuri so he would trap Gersch in the Kassimir Mechanism. Some steps but when looked back on...they can be easily made up for the 6 months in difference with release dates so no biggie there. First, we don't release Sam from it, only Sam gets pissed off the we released Gersh. Anyway, here's why the kassimir mechanism was put into the story, because it relates to the "Nazi Bell" experiment. 3arch loves "conspiracy theory", and tons of things from the zombie story line are related to that, the wunder weapons, etc. 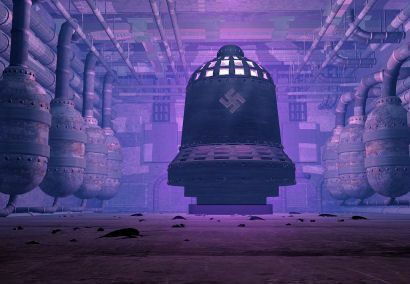 Anyway, the Nazi Bell was the only project during ww2 that was classified as "war decisive", it was put higher above any other project. Little is actually known about it, since somehow it disappeared, or was never discussed. It's possible that it managed to escape to Argentina, as many Nazi's did, or it's possible the Americans took it in with project paperclip, and simply never told the world about it, since it would have huge implications, instead the just went with W. Von Brauns drawings of the rocket that we *cough* still *cough* use in the space program today. That is also the "fly trap" that is found on Der Reise, which stands for "The Giant". The bell was also known as "Die Glocke", which has the initials DG, and we know that there is a DG2. Or second die glocke. Moving on, some people believed that the bell was actually a giant kassimir mechanism, which essentially is two uncharged sections of metal that rotate in opposite directions, around a fluid that seperates them. It's possible using the kassimir mechanism to levitate uncharged objects, like you can with magnets, however, as I said they are uncharged. What else does that look like to you? The teleporters? Also, that image is from abovetopsecret, not a Nazi Zombie website. Anyway, could the teleporters be the DG1? In other words the MTD = DG 1 = Die glocke. It all fits together very nicely if you ask me And that is why there is a kassimir mechanism in the story. Well Richtofen does mention that the pyramid is A kassimir mechanism maybe not the same type ya know? Plus, Richtofen wanted to free her so he could kill her. ATTENTION ALL CODZ MEMBERS. IT IS CASIMIR. NOT KASSIMIR. GOD DAMMIT. kk. So yeah so basically the Casimir mechanism is capable of creating a portal. The pyramid specifically being a portal.... to Aether/Hell. Yea, I won't lie, off the top of my head I have no idea how to spell khazeemhier mechanism, so I just tend to copy the person I'm talking to...blame the OP 0_o. Anyway, you can see where Treyarchs line of thinking went, from the Bell to Fly Trap, DG2, Der Reise, etc. I'm not too sure about the pyramid, I'd have to look into it, but I don't think it could do anything special that already couldn't be done. Some thought the bell could time travel, but they already can do that? I'm not sure if they knew they could time travel because Richtofen is surprised in the Kino intro that they went through time. However, I don't think Richtofen knew what happened. First he tried to kill Sam and Maxis, but they ended up teleporting. Then the Dr's saw Sam run into the pyramid, and used the MDT to transport Maxis to their location. Maxis then tells Sam to "Kill them all". But the characters make quotes about Sam, so he obviously must know she's controlling them? Very odd. just putting an idea out there but doesn't Rictofen, when typing on the computer during the moon EE, that he is powering up the kassimer mechainism (not the exact words).